Living in a rural area you tend to get a lot of free newspapers with a agricultural bent. Skimming the pages of NZ Farmer (March 28 2016) I came across a very informative article by Keith Woodford about European farmers expanding their value-add dairy production and its impact on New Zealand. Up to April 2015 European farmers were protected by production quotas and the Common Agricultural Policy (CAP) which provided large production subsidies which led to over-production. At the outset of the EU, one of the main objectives was the system of intervention in agricultural markets and protection of the farming sector. Production quotas in Europe were eliminated in April 2015 and from April to November European milk production increased by 4% with a 6% increase in December from the previous year. However, as with the reduction in subsidies in New Zealand in 1984, they will be a lot of pain for European farmers as their ‘safety net’ has now been taken away. The Europeans are producing as much cheese, butter, infant formula and cream as they can, with cheese being more important than liquid milk. The Europeans are also selling increasing quantities of UHT and infant formula to China. With both products, they are out-marketing New Zealand. Chinese infant formula statistics for 2015 show European countries with 78 per cent market share of imported product, compared to New Zealand at 8 per cent. The Europeans would like to decrease their production skim milk powder (SMP), but with butter and cream being profitable, they keep producing the SMP as a by-product. However, the European production of whole milk powder (WMP) has been drifting down in response to low prices. The European producers have protection from some of the Global Dairy Auction process through their reliance on value-add products. Also, apart from Ireland, all European dairy systems are 12-month-a-year production systems. These 12 month production systems can lead to higher production costs, but they also lead to lower processing costs through better utilisation of processing infrastructure. This then feeds back into higher farm-gate prices. The Europeans have been putting limited quantities of skim milk powder (SMP) into what are called intervention stocks. At the end of January 2016, there were about 50,000 tonnes of SMP in a public intervention store. The intervention quantities could reach a new limit of 218,000 tonnes over coming months. The main benefit of the SMP intervention is a smoothing of commodity prices. So if the price is too high stocks are released into the market and when they are too low authorities buy stock in order to reduce supply and therefore increase the price to a specific level. There is a good chance that in the longer term European milk production will further increase, as some farms become bigger and fewer in number. Poland has become one of the largest milk producers in the EU become a major milk producer with its flat terrain, very fertile soil, low feed and labour costs. Furthermore compared to other EU members it doesn’t have the pressure on land for residential use. Since joining the EU in 2004, the informal dairy sector is also still considerable in Poland, but the 2015 quota lift has seen these farms absorbed into the formal sector which in turn are expected to expand quickly without quota impediments. For this longer term, the Europeans are not going to try and compete with New Zealand with WMP. Europeans regard WMP as an outlet for product with no other immediate use. And they know that, in low-priced volatile commodity markets for long-life products, they lack competitive advantage relative to New Zealand. This entry was posted in Growth, Market Structures and tagged CAP, New Zealand, Primary Sector on April 3, 2016 by Mark. Global Dairy Trade – how it works? While milk production in New Zealand is lower this summer the global milk supply over the last year is strong with a 2.2% growth in Europe and 1.2% in the USA. This strong supply growth and the reduction in demand from China has led to downward pressure on prices. New Zealand Federated Farmers Dairy chairman Andrew Hoggard said the disappointingly weak GDT result would put more pressure on Fonterra’s “poor” forecast payout of $4.60 a kilogram of milksolids. These prices are generated by the GlobalDairyTrade which is an auction platform for internationally traded commodity dairy products. How does it work? Bidders cannot join a trading event part way through: they must participate in round 1 and can only maintain or decrease their total bid quantities from that point. Products can be purchased over different delivery time periods, known as contract periods. This entry was posted in Growth and tagged New Zealand, Primary Sector on March 21, 2016 by Mark. Below is a useful graphic from the BNZ and some commentary on the New Zealand milk production forecasts. Looking ahead, we continue to anticipate international price improvement into 2016 as a strong El Nino weather pattern dents NZ production and pushes up the global price of wheat. The BNZ forecast a 6% fall in NZ milk production for the 2015/16. This anticipated weather effect is expected to amplify a decline in NZ production already in train via fewer cows and low milk prices discouraging supplementary feeding. A large hit to NZ production could see prices rise swiftly. But, with EU production quotas now removed, more EU product would be expected to prevent prices from swinging as sharply higher as we have seen in previous years when NZ production was restricted. This entry was posted in Uncategorized and tagged New Zealand, Primary Sector on November 29, 2015 by Mark. Launched in 2001, the Doha round was to pick up where the Uruguay round of global trade liberalisation left off six years earlier. The deadlock in negotiations is ultimately down to a belief that the EU and the US and the large developing countries of China, Brazil and India have each given up more than its fair share in liberalising agricultural trade and the other side should do more. Subsidies are still a problem. Although subsidies have been used sparingly by governments in the past few years as international commodity prices rode high, they were used by the US and the EU during the depths of the global financial crisis in 2009 when prices fell sharply before rebounding. China, in its most recent reporting to the WTO, also indicated it had increased trade-distorting agricultural subsidies to a record $18 billion in 2010. There is still no rule in the WTO that export subsidies are illegal. The main objective is reforming people’s legal obligations so you have much fairer and open agricultural trading regime. Frustrated with the lack of progress at the WTO many countries have in recent years have looked to bilateral or regional trade talks for gains from trade. These deals have tended to bring about bigger tariff cuts in key trading partners’ markets more quickly than had they waited for consensus to be reached among the 161 countries of the WTO. However as far as the Doha Round is concerned it has broken the momentum of negotiations even though it does offer a more inclusive liberalisation of international trade. The effect of an intervention price on the income of EU farmers is shown on the graph below. The increase in farmers’ incomes following intervention is shown also: as has been noted, one of the objectives of price support policy is to raise farmers’ incomes. 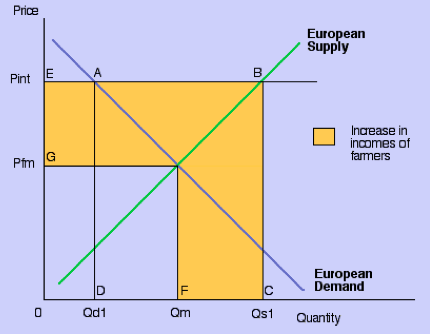 The shaded area EBCFG indicates the increase in the incomes of the suppliers of lamb. Throughout most of its four decades of existence, the Common Agricultural Policy (CAP) has had a very poor public relations image. It is extremely unpopular among consumers, and on a number of occasions it has all but bankrupted the EU. The World Trade Organisation is the rule-maker for trade between nations and the policeman for those rules. Comprising 161 countries, the Geneva-based body is the successor to the General Agreement on Trade and Tariffs (GATT) set up in the aftermath of World War II with the purpose of limiting the sorts of trade barriers which prolonged the Depression of the 1930s. The GATT was replaced by the WTO in the mid-1990s after the Uruguay round of global trade reforms. A Government report in 2002 estimated the Uruguay round would have added $9 billion to NZ farmers’ incomes in its first decade, mainly through improved access for exports of lamb, dairy and beef to the European Union and the United States. The WTO was set up in 1995 to finish off the work of the Uruguay round in eliminating trade barriers although the Doha round, through which this was to be achieved, was not launched until 2001 and has made little in the way of breakthroughs. As the global trading system’s policeman the WTO also adjudicates on trade disputes and has been used by NZ to get access to the Australian market for apples, South Korea for beef and Canada for dairy products. This entry was posted in Trade and tagged New Zealand, Primary Sector, WTO on August 6, 2015 by Mark. Here is an image from the recent Westpac Economic Overview. 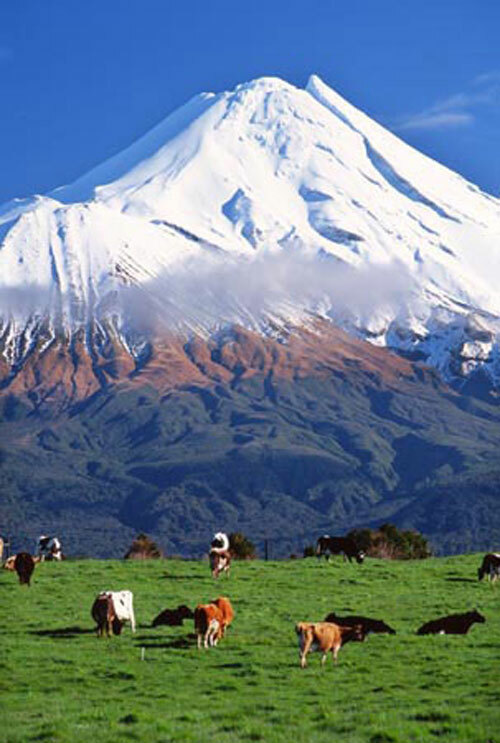 As New Zealand is the world’s largest exporter of dairy products any disruption in the supply from New Zealand can impact on the global dairy prices. The last few droughts saw world dairy prices increase considerably as milk supply from the rest of the world was unable to adjust to market conditions. However supply capacity in the US and the EU has increased and with Russia’s import ban there is a much greater supply on the global market. Nevertheless, this doesn’t disprove the possibility that prices rise when supply falls short. The overall signs are that supply and demand are coming into line as Chinese buyers run down stocks. The drought in New Zealand will further boost prices from current low levels. Westpac expect the milk price to rise to $6.40/kg for the next season. Below is a useful video clip from Dominick Stephens – Chief Economist at Westpac – about the primary sector in New Zealand. It is very good on fundamentals – supply and demand. This entry was posted in Growth, Supply & Demand and tagged Dairy, New Zealand, Primary Sector on March 3, 2015 by Mark.